Nice Wallpaper!!! Nice Background... funny meow!!! Good Job on wallpaper and Keep it up!!! Ooohh, I like the background *spins-spins----falls down* OOhhh o_0 Weeeeee!!!! I like this wallpaper... it's a very good job!!!!!! I love the meow hehe. ^^;; , very creative , thx for sharing it. Great image! Thanks for sharing your work with us! I hope to see more of it in the future. Nice bacground, and pic. Thanks for sharing. Hope to see more walls made by you. I really like this one. 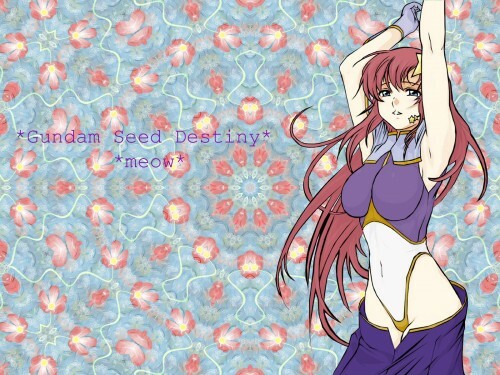 The background is very bright and beautiful and the Lacus scan is very sharp and clean. Awesome! The background and the foreground images clash terribly, and the font isn't good, but that's a hot picture of Meer.